Los Angeles: The family of Lauren Jackson and the Los Angeles Police Department are requesting the public’s assistance in locating the 14-year-old. On January 29, 2015, around 5:30 p.m., Lauren Jackson left her family home in the 6700 block of 88th Street in the city of Westchester. Her family is concerned for her welfare due to her young age. 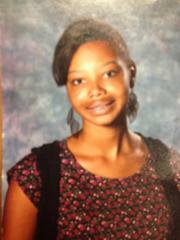 Lauren Jackson is described as a 14-year-old female Black, with brown hair and brown eyes. She stands 5 feet 10 inches tall, and weighs approximately 120 pounds. She was last seen wearing gray sweatpants, blue jeans jacket, converse shoes. If you have seen, or have any information regarding the whereabouts of Lauren Jackson, please contact LAPD Pacific Division at (310) 482-6445. During non- business hours or on weekends, calls should be directed to 1-877-LAPD-24-7 (877-527-3247). Anyone wishing to remain anonymous should call Crime Stoppers at 800-222-TIPS (800-222-8477). Tipsters may also contact Crime Stoppers by texting to phone number 274637 (C-R-I-M-E-S on most keypads) with a cell phone. All text messages should begin with the letters “LAPD.” Tipsters may also go to LAPDOnline.org, click on "webtips" and follow the prompts.